E.A.R.T.H. Lab’s mission is to create new forms of environmental art while developing related theories exploring nature with a fresh gaze and researching more inclusive, diverse and playful possibilities. UC Santa Cruz, whose current motto is ”The Original Authority on Questioning Authority” is the perfect place for this center since E.A.R.T.H. Lab questions prevailing notions of environmental art in order to entice new audiences to participate, to renew and strengthen the interests of existing allies. The conditions necessary for life on Earth to flourish are changing. 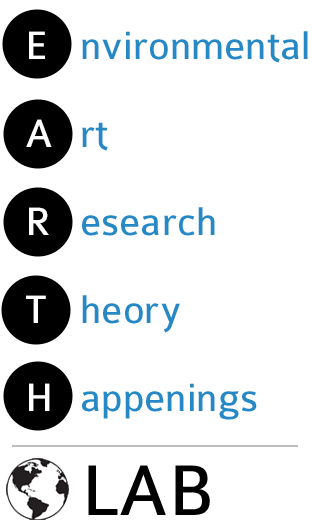 While scientific research and the rethinking of our social and economic structures are needed to sustain ongoing possibilities for the future, E.A.R.T.H. Lab posits that improvisation, creativity and even play are also necessary in order to imagine and navigate our way through the predicted effects of climate change and global warming that will radically alter familiar landscapes in the years ahead. Hope for a livable future in the face of great environmental uncertainty cannot be sustained with pragmatic reactions alone – these authorized responses are often reactionary. E.A.R.T.H. Lab embraces the future proactively, experimenting with a diverse range of direct responses to predicted challenges by collaborating across disciplines ranging from art, theater, games, social justice, environmental studies, queer studies, and more. E.A.R.T.H. Lab engages art to infuse the future with creative energy – questioning, developing, challenging, and transforming human interactions with the Earth. E.A.R.T.H. Lab builds environmental awareness through the arts within communities that do not ordinarily focus on ecological issues. While primarily art and performance based, this research center brings together networks of local, national and international artists and thinkers working in an array of diverse backgrounds, fields, and institutions. We invite collaboration. Join us.